A West Germanic tribe, by the first century BC the Sicambri were a large group that was occupying territory on the east bank of the Rhine. To their north, across the River Lippe, were the Bructeri, to the east lay the Cherusci, to the south were the Chatti, and to the west were the Marsi, Tencteri, and Usipetes, while across the Rhine were the minor Cugerni, who were probably a splinter tribe. For the main part, the Segni tribe on the banks of the River Mosa is also thought to have been a splinter of the Sicambri, but with other elements added. Also termed Sigambri or Sugumbri, the Sicambri name offers multiple choices when it comes to breaking it down. The 'si-' prefix is admittedly odd. Left to itself it means 'she'. There were probably one or more letters that had been dropped off, so perhaps it was originally 'sir' or 'sis', meaning 'oneself'? This may imply that they were Cambri who went off alone, almost certainly as part of the process of tribe division in and migration from Scandinavia and the Baltic and German coastlines. 'Cambri' is a Latinised form of a Brythonic word referencing fellow countrymen. It originates in the word 'combrogi', meaning 'people of the same land' or more specifically 'brothers-in-arms, compatriots', and similar expressions of a close bond. 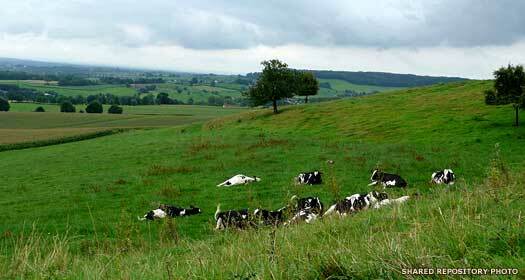 The modern Cymru and Cumbria in Britain have the same source and meaning, as do the ancient Cimbri. However, proto-Celtic words offer little help in breaking down the meaning of 'Cambri' in the sense of this tribe. The choices seem to be between *kambito-, meaning 'fellow', *kom-bī-to- (? ), meaning 'battle', and *kom-bero-, meaning 'confluence'. Only the last one has the requisite K-M-B-R sequence. Proto-Germanic offers *kambaz (sb. masculine), which is Old Norse 'kambr', Old English 'camb', Old Saxon 'kamb', and Old High German 'kamb', all meaning 'comb'. This is identical with Tocharian 'kam' and 'keme', meaning 'tooth', Sanskrit 'jámbha-', meaning 'tooth, tusk', Greek 'gÒmfow', meaning 'peg, nail', Albanian 'dhëmb' and 'dhamb', meaning 'tooth', Lithuanian '≥aMbas', meaning 'sharp edge', Latvian 'zùobs', meaning 'tooth', and Slavic *z‡b˙ (a comb itself has teeth, of course, which is the common link here). While this word seems widespread, it uses the wrong initial vowel and is unlikely as a tribal name. Another possibility is *kembaz and *kembò (sb. mas/fem), which presents in the Swedish 'dial', or 'kimb', meaning 'ends of a stave protruding over the ground', and Middle Low German as 'kimme', meaning 'rim'. The 'r' is missing, but this may not be a problem as '-er' indicates a doer of some action. But what action? This uncertainty largely kills off this avenue of exploration. Based solely on the vowel sequence, the favourites seem either to be the proto-Celtic 'kombrogi', meaning 'compatriots', or possibly the proto-Celtic 'kombero', meaning 'confluence'. Combrogi seems the most likely choice, based on frequency of use elsewhere. Alternatively, perhaps the original Cambri home was in a location at which two rivers came together? Or the confluence could be meant in the sense of where the Atlantic Ocean met the Baltic Sea, which is where they lived. Either way, it points to an early Celtic influence, making it likely to be a resident tribe of the Cimbric Peninsula or southern Baltic coast where it could have interacted with Belgic tribes. In theory it could even be Belgic itself, slowly made more Germanic by being surrounded by other Germans who were becoming a dominant force in Northern Europe. The Sicambri were one of the main branches of the powerful fourth century confederation known as the Franks. As with most Germans, their origins lay in the aforementioned Scandinavia and the northern reaches of mainland Europe, but later legend claimed a homeland for them in the region of the Black Sea. They gradually migrated to the Rhine and were first documented when they were to be found occupying territory on the Lower Rhine valley (on the east bank, in what is now northern Belgium and the southern Netherlands), during the third century (the Period of Migration). This unsettled period eventually forced the creation of several new alliances and confederations, with the Franks being one of the biggest of the latter. They were one of several West Germanic federations, and were formed of elements of the Ampsivarii, Batavi, Bructeri, Chamavi, Chatti, Chattuarii, Cherusci, Frisii, Salians, Sicambri, Tencteri, Tubantes, and Usipetes. Most of these peoples were already living along the Rhine's northern borders in what was becoming known as Francia. The Frankish realm underwent many partitions and changes of border, since the Franks divided their property among surviving sons and, lacking a broad sense of a res publica, they primarily conceived of their realm as a large swathe of private property. By the fifth century the Hetware (Hætwere) were closely associated with the Franks, perhaps following them down from the lower Netherlands where they seem originally to have been associated with the Frisii. The Lesser Frisians mentioned by Tacitus seem also to have migrated southwards with the Franks. This new 'kingdom' within rich Roman territory must have been quite enticing. Although at least three main branches of Franks were apparent by the fifth century, the only branch which seems to have retained a genealogy of any length was that of the Sicambrian Franks. In any realistic sense, this begins at the end of the first century BC when counting back from the earliest datable ruler, but before that point it goes back to a mythical Greco-Roman ancestry which was very much in fashion when Germanic genealogies were being embellished from the ninth century AD onwards. All of the legendary tribal leaders of the Franks are shown here with a lilac backing. 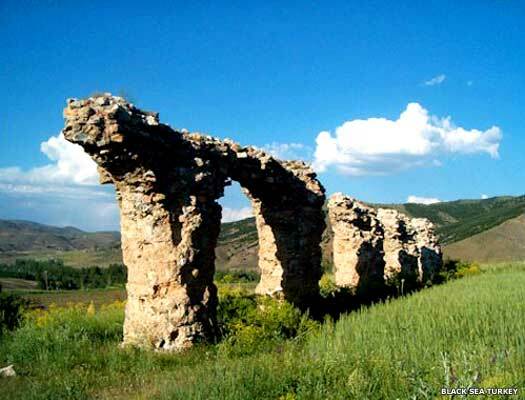 Legendary leader of the Cimmerians on the Black Sea coast. According to later Frankish legend, in honour of the mother of Priamus the Cimmerians change the name of their tribe to Sicambri (or, more probably, something closely resembling Cambri, which would suggest that there is no name change at all - Cambri/Cimbri is close enough to Cimmeri for this to be the very source of the later false link to the Germanic Sicambri). Whilst the link to the Sicambri can be discarded, this does seems to point to a specific tribe of Cimmerians rather than all Cimmerians. As for the migration story, this is likely to be an invention to explain to a medieval audience the similarity between the Cambri and Cimmeri names. From Antharius and Franco onwards, the genealogy of the Sicambri assumes an air of increased reality, although it is entirely uncertain whether any of these people ruled, or even existed. However, the Greek-inspired addition of Antenor IV aside, many of the names probably do represent real leaders. By this time the Sicambri have migrated into the forests of Germany and to the east bank of the Rhine, where Antharius fends off the military attentions of Julius Caesar. King of the Sicambri. Withstood attack by Caesar. Died 39/37 BC. 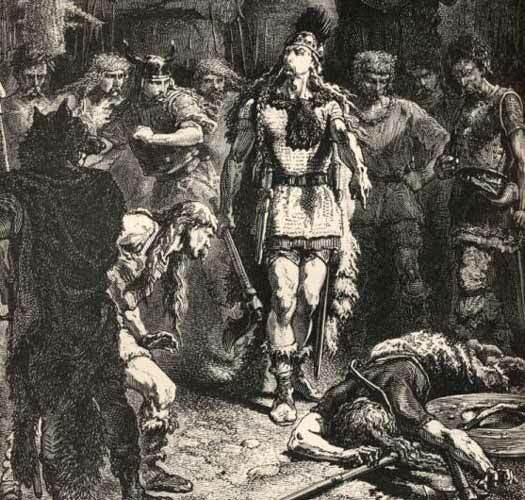 As recorded by Julius Caesar in his work, Commentarii de Bello Gallico, the Germanic Tencteri and Usipetes tribes are driven out of their tribal lands in Germania by the militarily dominant Suevi. Their wanderings bring them to the mouth of the Rhine, in the territory of the Belgic Menapii, who are located on both sides of the river. The Germans attack them, forcing them to withdraw to the western side of the Rhine, where the Menapii are able to defend the river line for some time. They also attack the Condrusi and Eburones tribes. Feigning a withdrawal to lure out the Menapii, the Tencteri and Usipetes defeat them, capture their ships and occupy many of their villages for the winter. Caesar, alarmed at this threat to the north of territory in Gaul that he has already conquered, takes a force into the region. After much diplomatic effort and some delays, he attacks the Germanic tribes and drives them back into Germania with heavy losses. Both tribes follow the east bank of the Rhine upstream and find refuge with the Sicambri. They remain settled in these lands for much of the remainder of their existence. 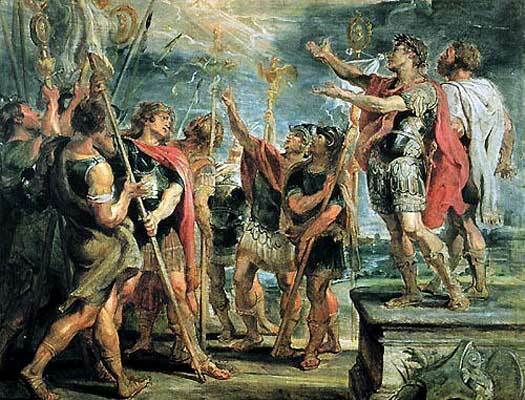 Caesar crosses the Rhine to follow them and to show the Germans that Romans are not afraid to stage a counter-invasion. Another reason is that a portion of the cavalry of the Usipetes and Tencteri had not been present at the recent battle. Instead they had proceeded to the territories of the Sicambri to join this tribe, remaining defiant. Several other tribes submit to Caesar, but the Sicambri withdraw from their territories on the advice of the Usipetes and Tencteri. Caesar remains in their lands for a few days before burning down their villages and taking their corn. Caesar enters the country of the Eburones, forcing the rebellious Ambiorix to flee and his co-ruler to commit suicide. Despite this apparent capitulation, the country of the Eburones proves difficult for the Romans, so Caesar invites the neighbouring people to come and plunder the tribe and, after stubborn resistance, Caesar burns every village and building that he can find in their territory, drives off all the cattle, and confiscates all of the tribe's grain. The Sicambri take the opportunity to cross the Rhine and surprise many of the plunderers, seizing a large part of the Eburones' cattle. Emboldened by their sudden gains, the Sicambri are easily persuaded to attack the main Roman camp with the promise of further riches and little opposition from the small garrison and a large number of invalids. After being surprised, the Roman defenders manage to rally under Sextus Baculus. They are reinforced by the returning foraging party and the Sicambri withdraw, seeing that they will not now prevail. They withdraw across the Rhine with their plunder and Caesar is able to settle his men into winter quarters. Possibly a real leader of the Sicambri? 'Son' of Antharius. Possibly real or a legendary name. Farther to the south and east in Europe, with Celts now inhabiting the most inhospitable and least desirable parts of Thrace, they appear to pose no threat to Rome. Their steadfast refusal to acknowledge Rome's rule and send recruits to serve in the Roman army is a threat, however. A Roman legion led by Pomponius Labeo arrives from Moesia to join the one in Thrace, and Sicambri cohorts are added to the force. The Thracian King Roimitalkes I of Sapes also supplies a body of auxiliaries from the Odrissae, amounting to a sizeable army to deal with the Celts. Leader of the Sugambri according to Strabo. Melo organises a raid and defeats a Roman army under the command of Marcus Lollius, which sparks a reaction from the empire and helps to trigger a series of wars against Germanic tribes. Later the Sicambri under Deudorix, son of Baetorix, join the rebellion of Arminius (in AD 9). As well as mentioning Melo, Strabo also names the same 'Deudorix, a Sugambrian, the son of Baetorix the brother of Melo...' All of these names are Gaulish not Germanic. Clearly the German tribes that live along the banks of the Rhine are already very mixed with the Gauls or, more probably, the Belgae who have always exhibited some level of Germanic influence. Again, the Sicambri themselves could also be Belgic in origin. The second century AD Roman historian Flores notes that the Cherusci, Sicambri, and Suevi have formed an alliance by crucifying captured Roman centurions. Cassius Dio relates that Nero Claudius Drusus Germanicus, stepson of Emperor Augustus, is appointed governor of the Rhine region of Gaul and undertakes four campaigns against the Germanic tribes. After building a fortress on the island of the Batavi and defeating the Frisii, he undertakes some difficult fighting in which he is generally successful, subduing the Chauci near the mouth of the Weser. In 11 BC, he conquers the Bructeri, Usipetes and Marsi, extending Roman control into the Upper Weser. In 10 BC, he launches a campaign against the Chatti and the resurgent Sicambri, subjugating both. The following year he conquers the Mattiaci, while also defeating the Marcomanni and Cherusci, the latter being taken care of near the Elbe. Drusus is killed in a fall from his horse during his fourth campaign, and his death deprives Rome of one its best generals. Son. Leader of the Sicambri. 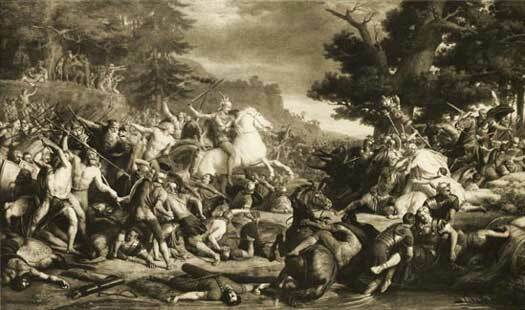 Arminius declares the independence of the Cherusci from Rome, decimating three legions in the Teutoberger Forest. He achieves this momentous victory in an alliance with the Bructeri, Chatti, Chauci, Marsi, and Sicambri. In AD 15, Germanicus invades northern Germany and, following two Cherusci defeats in AD 16 (Idistaviso and the Battle of the Angrivarian Walls), Arminius is murdered in AD 21. Sicambrian Frank with Greek name. Probably added much later. Ptolemy, who writes in the mid-second century, places the Sicambri to the south of a group of westerly Suevi Langobards, in the Rhineland. To their east are the Suevi Anglii, while along the Elbe are the Chauci, to the east are the Semnones, and then there are the Suebi, perhaps the original core tribe of the confederation, which is apparently settled on the Rhine to the east of the Ems. The Germanic Franks are first documented during this century (the Period of Migration), when they are to be found occupying territory on the Lower Rhine valley (on the east bank, in what is now northern Belgium and the southern Netherlands). They are one of several West Germanic federations, and are formed of elements of the Ampsivarii, Batavi, Bructeri, Chamavi, Chatti, Chattuarii, Cherusci, Salian Franks, Sicambri, Tencteri, Tubantes, and Usipetes. Most of these peoples live along the Rhine's northern borders in what is becoming known as Francia. The fortunes of all of these tribes are now tied to the greater, and growing Frankish collective. Frankish leader Ascarich and his co-ruler lead a raid across the Rhine into Roman southern Gaul, apparently breaking a previous agreement. They are defeated, captured, and executed in an amphitheatre by the simple means of allowing them and their followers to be torn apart by animals to the applause of the crowd. They are the first Frankish leaders to have their names recorded for posterity. It is possible that an invasion of the territory of the Bructeri in 308 is also part of the retaliation against the Frankish confederation for this attack. Seemingly more realistic names begin to appear now. The Salian Franks and their Batavi allies are accepted into the northern Roman empire by Julian the Apostate. Also in Gaul is Mallobaudes, another Frankish chief of unknown origin. Between 354 and at least 380, he serves in the Roman army, helping to defeat the Alemanni in 378 and killing Macrian, king of the Alemannic tribe of the Bucinobantes in 380. Dagobert is the last purely Sicambrian name to be listed. The next name in sequence in most lists is Gendobaud, one of three leaders of the Salian Franks at this time. This suggests that, however fanciful some elements of the list may be, all chroniclers accept that the Sicambri are now dominated by the Sali as the Frankish confederation grows in strength and numbers. Gendobaud, Sunno and Marcomer lead an invasion of Salian Franks into the Roman provinces of Germania and Belgia. Their warriors break through the limes, destroying farmlands and killing people around the city of Cologne, before retreating across the border with their booty. Roman General Quintinus mounts a reprisal raid across the border but his troops are surrounded and beaten, and very few of them make it back. A later source suggests that after the death of Sunno, Marcomer attempts to unite the Frankish tribes by proposing his own son, Pharamond as the first king, or perhaps 'high king' would be more appropriate. His success or failure is unrecorded, but in the early fifth century, Pharamond is certainly regarded as the first (high) king of the Franks. From this point, rival Frankish divisions begin to be recorded, and the Sicambrian Franks themselves emerge more into history than the traditional genealogies of previous leaders can allow. The Salian Franks prove to be strong rivals to the Sicambri, although it appears that both branches soon merge under the Salian banner and follow a single, semi-legendary leader in the form of Merovée. By now relatively minor groups of Franks are settled on the west bank of the Rhine in various 'kingdoms' which cover areas of north-eastern Gaul, along with some groups of Suevi. They defend the Rhine against invading fellow Germans and remain a strong force in support of Rome for most of the century, and eventually, under Clovis, even strive to replace Rome as a European empire-builder. During the crossing of the Vandali (to avoid the Huns), the Franks attack this apparent threat to their own position. The Alani, also crossing the Rhine, come to the aid of the Vandali and save them from destruction. Roman government in the area centred on Soissons is maintained, even though the region becomes more and more isolated from Italy and surrounded by Frankish states to the north-east and by the Visigoths to the south. From 461 it becomes fully independent in all but name. According to Roman historian Prosper Tiro, Pharamond (probable son of Marcomer) leads his people across the Rhine to settle on the west bank. As there are already Franks there (perhaps Sicambrian Franks), Pharamond's arrival could spell the first presence of the Salian Franks inside the Roman empire. The Bructeri, along with the Tencteri, Tubantes, and Usipetes, do not migrate at all. Instead they remain in their traditional tribal lands and gradually coalesce into the more minor Ripuarian Franks who remain on the east bank of the Rhine. The Salian Franks remain dominant during the fifth century, while the Sicambrian Franks appear to fade out of the picture, suggesting their full integration within the Frankish mass as a supporting group. In the later years of the fifth century Clovis unites the Salian and Ripuarian Franks and creates the Merovingian kingdom.